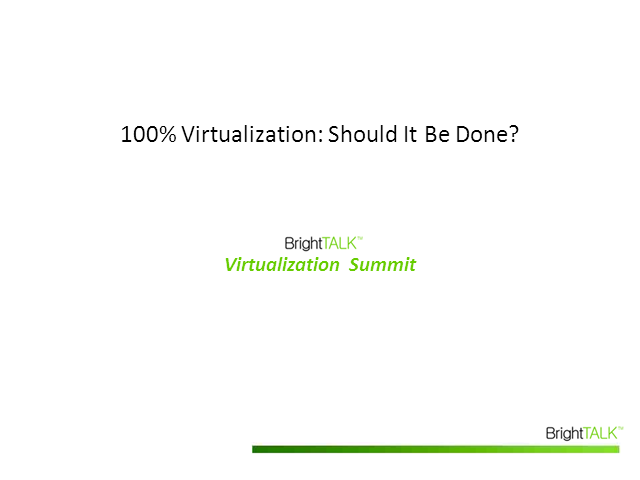 100% Virtualization - Should It Be Done? Virtualization, from server to storage to desktop, has become the norm for many companies today. However, is there such a thing as too much virtualization? What does it mean to be 100% virtualized and should organizations be doing it? Join this expert panel as they discuss the benefits and issues that may arise from completely virtualizing an environment, and if it is a viable option for organizations today. Title: 100% Virtualization - Should It Be Done?